As part of Carnival Cruise Line’s Honor. Family. Fun. 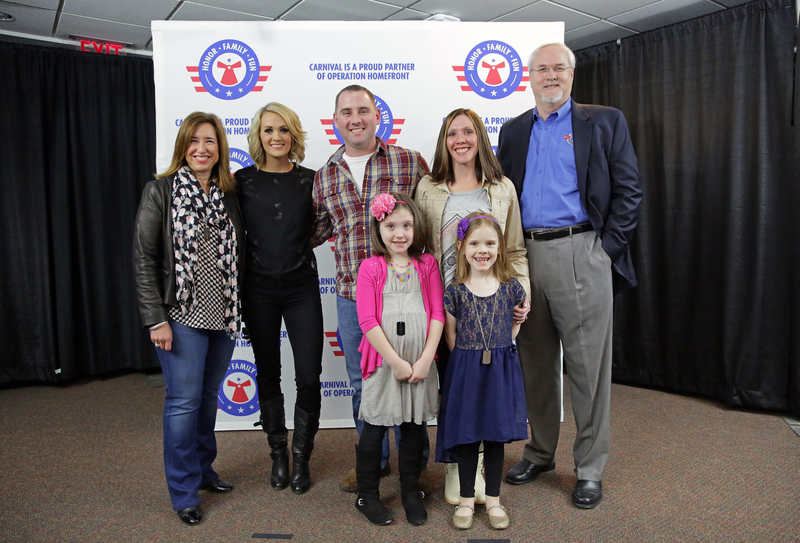 initiative in partnership country music superstar Carrie Underwood and the military assistance organization Operation Homefront, the seven-time Grammy winner hosted a special meet and greet for military families prior to her show last night at the Wells Fargo Center in Philadelphia. Underwood was joined by Carnival President Christine Duffy and Operation Homefront Board Member Marty Hauser as she surprised the Martin family with an opportunity to attend a private, invitation-only concert for military families aboard Carnival’s newest, largest and most innovative ship, Carnival Vista, when the vessel makes its U.S. debut in New York in November 2016. The meet and greet was one of 10 pre-concert opportunities that Carnival, Underwood and Operation Homefront will host for military families in various cities across the U.S.
Additionally, Carnival is selling special commemorative Honor. Family. Fun. dog tags aboard its ships and at all of the stops along Underwood’s The Storyteller tour with proceeds benefiting Operation Homefront. Currently under construction at the Fincantieri shipyard in Italy, Carnival Vista is set to debut May 1 in Europe and will offer a number of exciting and unique features, including the RedFrog Pub and Brewery, the first IMAX Theater on a cruise ship, the new Family Harbor staterooms and suites and a one-of-a-kind aerial attraction called SkyRide.